People love images. I do too. A picture is worth a thousand words. Here are picture galleries of the work in progress that I will be updating on a regular basis. Think of this as an annotated graphical synopsis of the project. People on the go, like me, will find it pleasurable to just scan through the images without having to peruse the details. The Fret Markers. The motif is the reverse (white on black) pipe-organ keyboard. Mother of Pearl is just so elegant! One more snapshot. The gloss is just to protect the inlay. We haven’t even buffed yet. The final result will have a mirror finish! 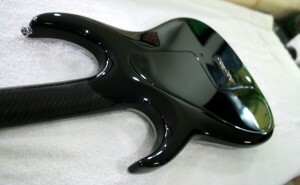 Cavity fully routed out with logo. 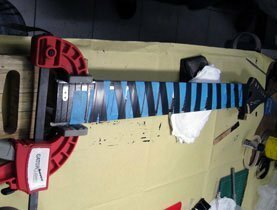 Binding the guitar using stainless steel proved to be very tricky. 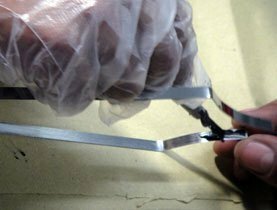 This is the first time I used stainless steel as binding material.The stainless steel strips are glued in using epoxy formulated for bonding metal and wood. Final wrap with taut tape. Now the neck looks like a Mummy! 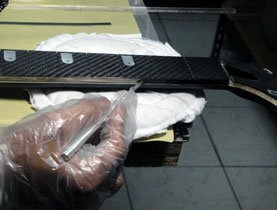 I found this article in the web offering a different approach to fret installation, cutting a wider fret slot and using epoxy to hold the fret. The fret’s tang must be trimmed at the ends using an end-cutter. 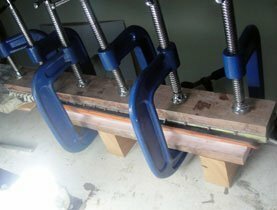 Epoxy is injected into the slots and the frets are clamped using a clamping caul. 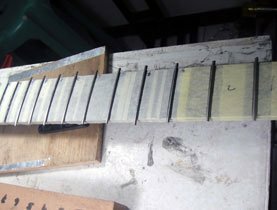 Frets placed. There’s no need to hammer or press the frets. The frets slide in easily. I still have to write more documentation. I am terribly lagging behind. I’ll definitely have more time in April. Anyway, for now, here are some high resolution pictures.Compare these against the original 3D images. Hi Joel. Very professional job! 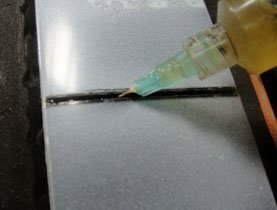 Tell me please – what are you covered over epoxy resin? What did you use varnish? Thank you, Oleg. I use Dupont polyurethane for finishing. Very cool build! 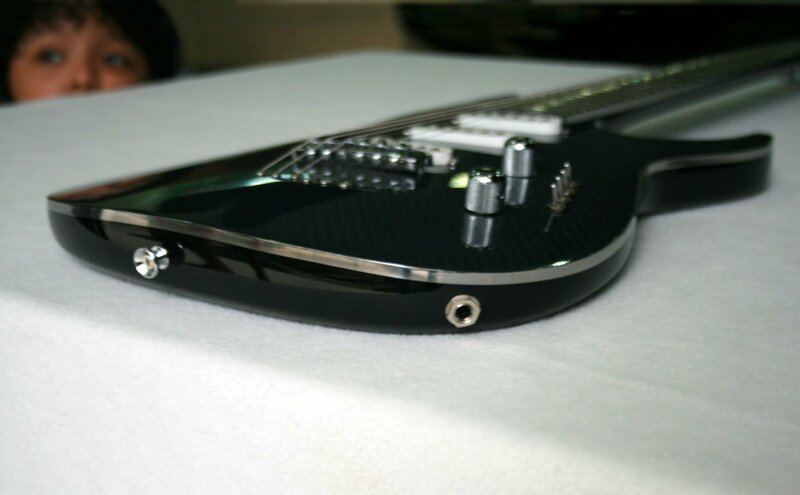 I like the side dot led option and the fanned fret idea (optional) would also add to the non-traditional, unique vibe you have going. Is it still possible to refret using traditional methods (such as heating them with a solder gun and cleaning the slots) since the frets are epoxied in? Will this cause any fretboard tearout and if so, can this be repaired like new? Off to peruse your site more thoroughly! Thanks, Tony! 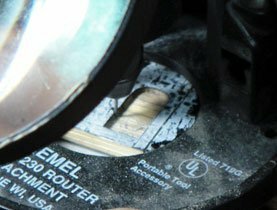 Yes, refretting is possible using a solder gun. I've done it. There's no tearout at all if you are careful. Just be careful not to damage the finish. 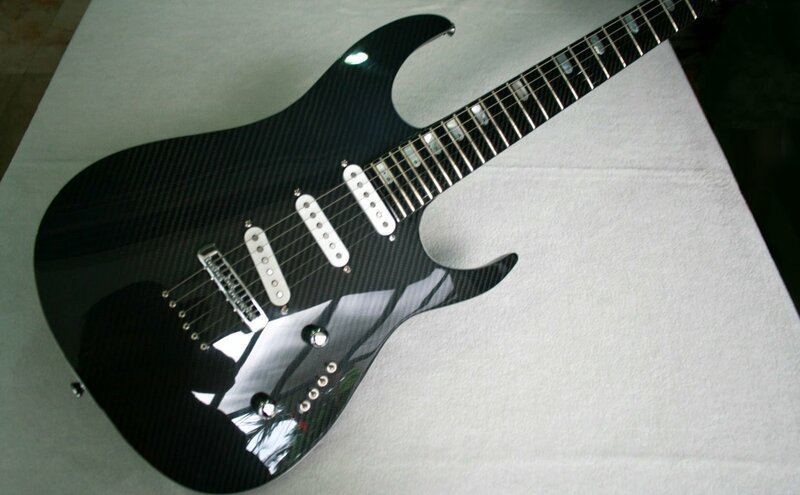 Personally I would like to see stainless frets on that beauty. If you're gluing in nickel silver, then once they wear.. meh. Stainless will last quite a long time, and since this is kind of an art piece, you might as well go for stainless. 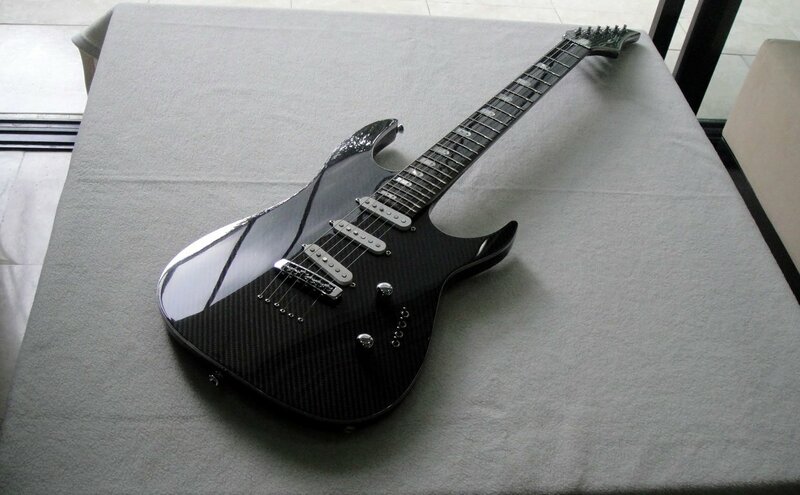 Also, if you go all out, make one with a fanned/multiscale fretboard. The only difference on the bridge for that would be individual bridge/saddle pieces. the whole thing has a future vibe to it sooo.. that's my 2 cents. 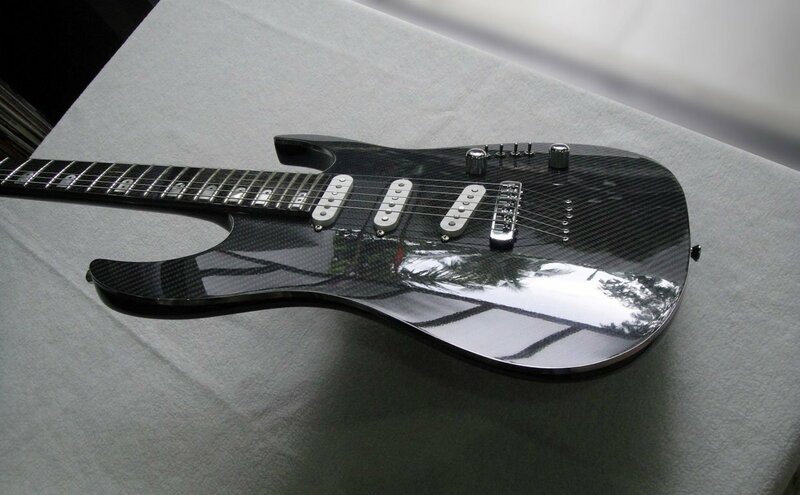 Stainless frets, multiscale fretboard. Thanks, James. I agree 100%. 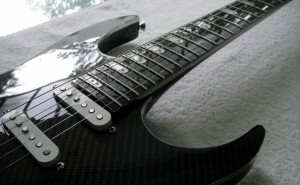 Multi-scale fretboards are indeed quite interesting. 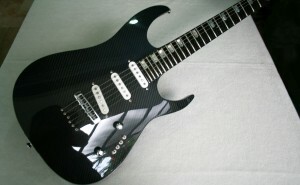 Stainless steel frets? You bet! I am not using them now, but I intend too. 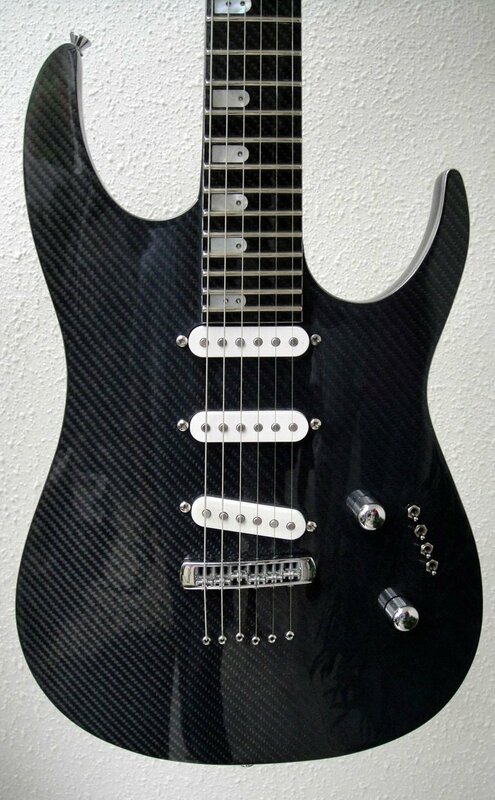 In my humble opinion, I don't think you should do away with fretboard inlays (LED or fibre optic). I've owned guitars in the past with LED fretboard inlays and they are a godsend at times (like Joel stated, during particularly dark gigs, or for special shows, etc.). I agree, they can look tacky, but they can also look quite subdued as well. 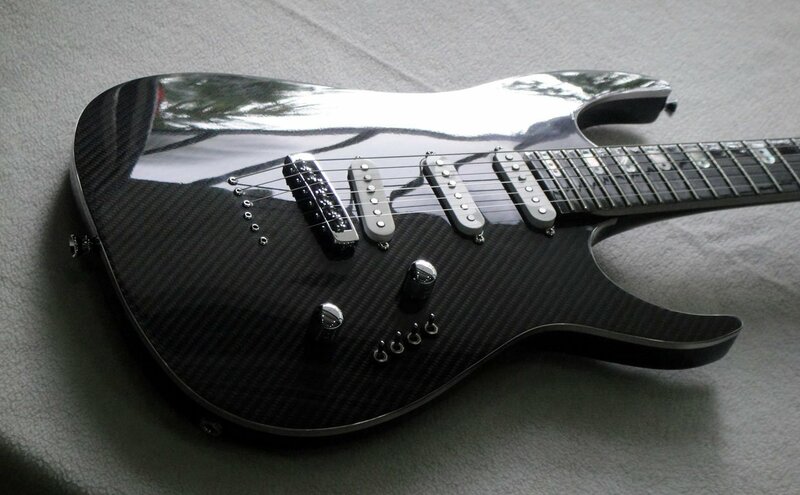 I think it definitely depends on what inlays they are put behind and the type of guitar they're put in. There is definitely a demand for LED fretboard inlays and side dots. 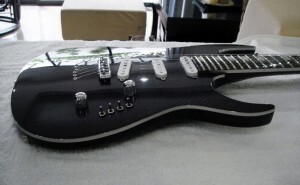 There is a reason why guitar companies such as Moser Graphite, Ran guitars, Alembic, Warrior, and other custom builders offer them as option on to they're customers. 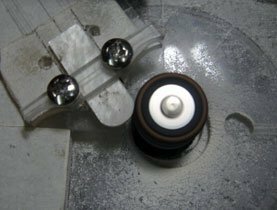 Likewise, there is also a reason why companies that specifically offer retrofitting of LEDS into necks such as Sims UK and Aurora Project UK are around….some people really like 'em. 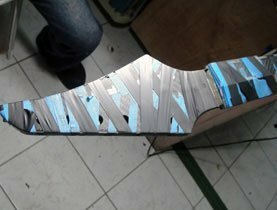 Myself in particular, side dots would be cool, but small fretboard inlays with LEDS that can be activated (and maybe dimmed) if I need them would be the icing on the cake. Besides, this is a carbon fibre/bamboo guitar. Let's just say it's not exactly conservative to begin with! Ok, let's have it as an option then. Thanks, DC! Have you considered flipping the headstock upside down so that the tuners are below instead of above the headstock? This would be more ergonomic, and it would also shorten the thinner strings and lengthen the thicker ones, although I don't know whether this has any impact on tuning stability but on paper it makes sense. 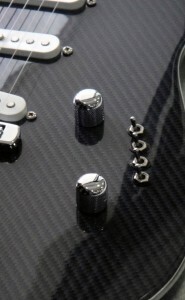 I like the fact that the strings don't deviate above the nut (they are perfectly straight all the way to the tuner). I think any serious guitar should be built this way, to prevent "jumping" when tuning. 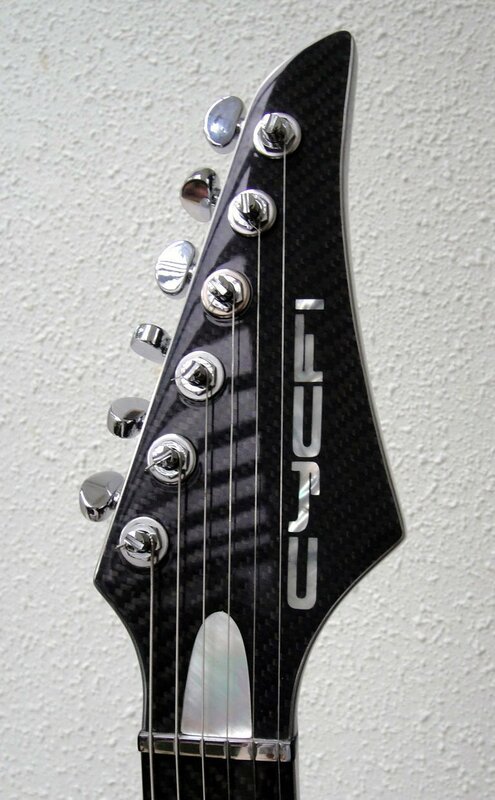 Another idea for the headstock would be to have 3 tuners on each side and shape the headstock as an arrowhead in order to allow for the strings to stay straight above the nut. I like the fact that you use single-coil pickups with a fixed bridge. 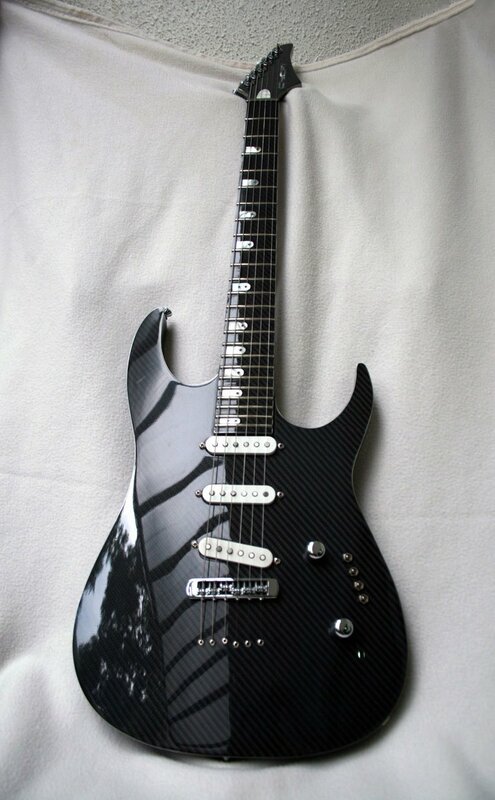 This design is so rare (other than Telecasters, which are so ugly). 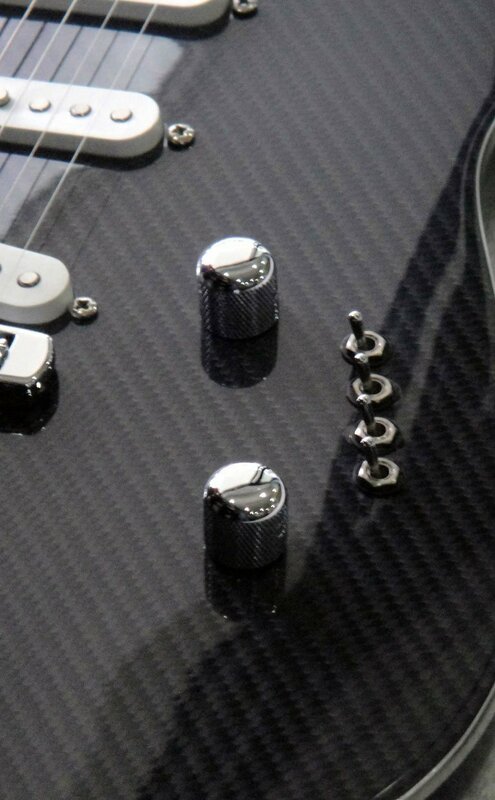 Usually single-coil guitars have tremolo bridges, and humbucker guitars have fixed bridges, and there is no deviation from that other than the Tele. 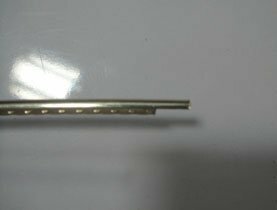 Have you thought about using an RMC transducer for the bridge saddles? It will allow the guitar to drive Synths like the Roland GR-55. 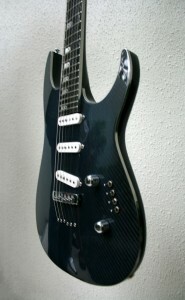 A good example of this type of guitar is the Godin LGX-SA. I saw you are installing LEDs under the fret markers. 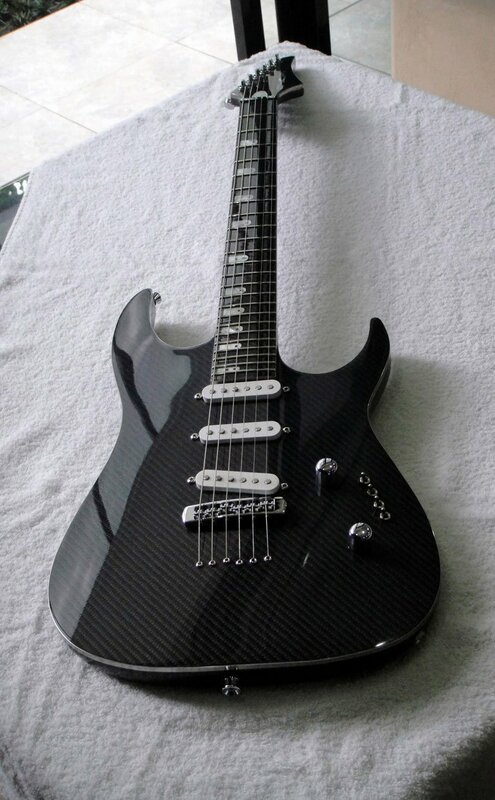 I think that's a little cheesy and it could diminish the perception of prestige for such an amazing guitar. I think you are building the perfect guitar and you do not need any "bells and whistles" or gimmicks that have no functional purpose. Less is more. 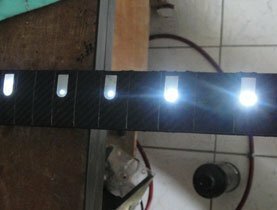 If you really want to explore the LEDs imbedded under the fretboard, then you should make them functional: give them a purpose to exist. 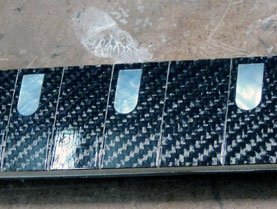 You could build a model that has 6 LEDs on each fret space, and wired them up to light up according to different scale patterns or chords, like the Fretlight guitar. I like the earlier Freglights that could be used independently from a computer. They just had 2 additional knobs: one with the letters A thru G and the other one with the 7 modes (Major, Minor, Mixolidian, etc.). 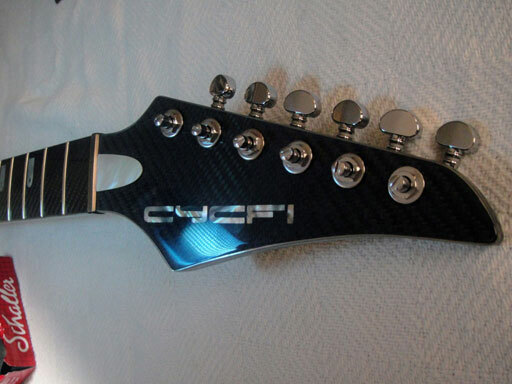 No matter what you decide to do, please keep me posted, I want to be one of the first owners of CYCFI guitars, and if I really like it, I would like to be involved in marketing it. I think you have a niche and there is serious potential for your product. Those are very nice remarks, Paul! And I really appreciate your suggestions. Thank you very much for your interest. 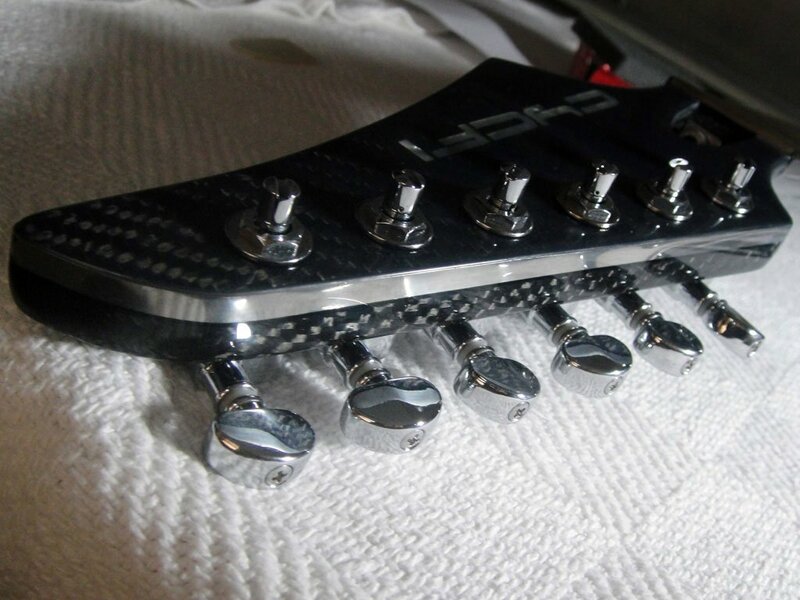 Prior to conceptualizing Alpha, I've collected various ideas on various aspects including the headstock. There were so many ideas. A lot of them were even somewhat radical. For example, I considered having classical-style tuners where the orientation of the pegs is most natural (i.e. 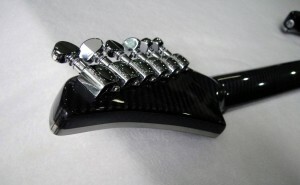 you don't have to twist your arm to reach them as you do with tuners on either the bottom or the top). 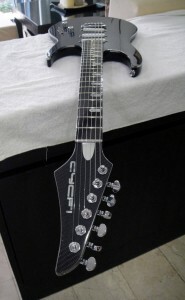 I've also thought about using Steinberger Gearless Tuners, also with a nice knob placement: http://tinyurl.com/6ptvgeb and even no tuners at all at the headstock (like Floyd-rose guitars such as: http://www.edroman.com/guitars/floydrose.htm) with tuners at the body. 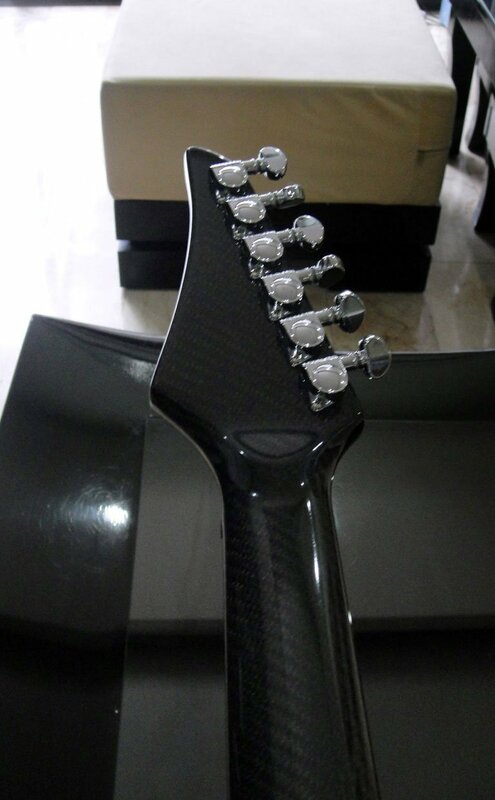 Yes, I also considered reversing the headstock. These are all nice ideas, but in the end, for Alpha, one design constraint I stuck with is to stay closer to the traditional style (for both the body and head) as much as possible. I did in fact had various takes on these ideas at the CAD (3D modelling) design stage an showed it around. The response was mixed. Perhaps I haven't caught the right design yet, in terms of aesthetics. Perhaps, it will be different with the next iterations, with more people such as you to solicit comments from. One advantage of a reversed headstock that I can think of is possibly improved sustain. The thicker, longer and hence more massive strings can have a greater effect on sustain (at certain resonant frequencies, of course). However, I've recently discovered that making both ends (bridge and head) heavier has a better effect on sustain (more on that in a future article). The mass of the end points stores the energy of a plucked string and, much like a pendulum, releases it back to the string. 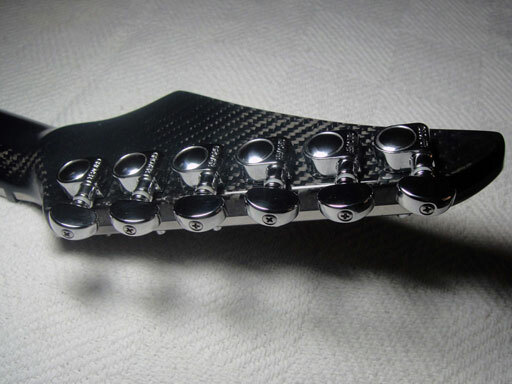 As for tuning stability, there should be no problem with any of these headstock ideas. However, one concern that needs to be studied and empirically tested is unwanted resonance. If the length of a string (or strings) coincide with a bad harmonic(s) it can cause unwanted resonance that can ruin the tone and/or degrade sustain. Sometimes this can be apparent and the remedy is to put dampers (felt cloth) up there (like Pianos do). I love hex pickups. I love hex processing –beyond MIDI and keyboard-flavored synths like Roland's. I believe there's yet untapped potential there that I want to explore. You are not the first who criticized that. Now, I have to agree and that feature is history. Yay! It all started one day when on a very dim gig, I lost my positions and fretted the wrong keys! Haha. Anyway, at the very least, how about small fiber-optic position markers at the top binding instead of the fretboard (like this: http://tinyurl.com/7ddn4lj)? Since Alvarez doesn't make electrics, I've been looking for something fresh. 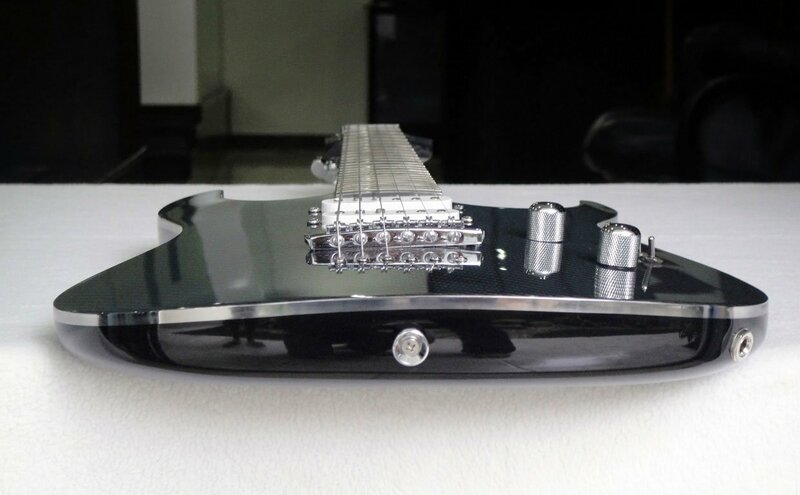 This is THE coolest guitar I've seen [and I've liked telecasters with f-holes till I saw this.] The body shape isn't trying to make an outrageous statement, I love the idea of going green, and the small fiber optics on top of the guitar neck [I finally have a reason to play in the dark haha] But I really do enjoy that above all it is still a classy looking guitar. Truly inspiring, keep up the good work! Thank you for your interest, Zay. I'll keep you posted. Oh my goodness, what a beautiful guitar. Thanks, Colling! Unfortunately, you can't buy the steel binding anywhere. We buy sheets and laser cut them based on the 3D CAD model. I'm making an acoustic guitar for my final major project at uni, I wanted to use bamboo to make the neck, I was hoping you could let me know where you sourced the bamboo from? Thanks, Bertie. We manufacture the bamboo planks ourselves, which I would not recommend since it requires you to build some custom-made tools. I would suggest instead to go get some manufactured bamboo flooring. Check out this project: http://tinyurl.com/3t7x3u9. He was inspired by this project and built a bamboo neck, but used manufactured bamboo flooring instead.